Rip (verb): digitally extract audio from Audio CD to computer. Once a CD is inserted metadata is read from the Internet, also an offer is made to find the drive offset, this unifies the ripping results from your drive in comparison to other brands of CD drive. Before ripping it is useful to check the metadata, this can be done with the review metadata button 4th button from left at the top. Metadata from each individual provider is shown, highlighting any differences. Should the album art be incorrect, left click on the artwork and choices from the Internet are shown. Path sets where Ripped tracks are saved, it defaults to your Music folder. Click the Rip button to begin ripping. It is always preferable to correct metadata pre-ripping, correcting after ripping involves changing the ID Tags and potentially the filename also. When it comes to tagging, your preferred audio player might have limitations with regards to reading certain tags such as Album Artist, or multiple artist support. These are the best practices for ID Tagging: Album Artist - imagine you had an album, it has a main artist, but for some of the tracks there are guest artists, the main artist might not even be listed on a track, the album artist is set to the main artist which ties together this album. Compilation - this should be checked if there are different artists on track by track basis. Compilation is often used by players which do not use the Album artist to group an album from different artists together. Tagging box sets - you have many options here, for many people having a 3 disc album appear as Album, Disc 1...Album, Disc 2, Album Disc 3 is preferred, the disc number is set to 1/3, 2/3, 3/3 in this instance. For others they prefer to have box sets as one single continuous album, to do this, when inserting the 2nd disc, keep the disc number as 1/1, check that the album title matches the first disc exactly and apply a track number offset (right click on track one >> Apply Track number Offset >> 100), this will set disc 2 to have track numbers starting at 100. For disc 3 repeat the same process, selecting a +100 offset twice. AccurateRip by comparing results from other peoples rips, a match to their rip is a 100% certainty it was without error, no other secure ripping method can get this close to verifying error free rips. Meta data comprises identification fields, such as album, artist and artwork, and is embedded into audio files in their ID Tags. PerfectMeta™ uses 5 Internet meta data providers simultaneously, this allows errors such as spelling mistakes to detected and corrected. PerfectMeta offers the best metadata solution obtainable today. Metadata can be typed manually on the main page by selecting a track and pressing F2, after typing press enter to move onto the next field (artist) or down arrow to move to next track. Clicking the Tags tab (bottom middle), lists meta data for a selected track or the whole disc if no track is selected. Items shown in gray are excluded from being written (click Menu >> CD Ripper Options >> Meta Data & ID Tag 'Options' to view exclusions). When the genre is set to Classical or Opera a section with Work and Movement appears on the tool bar, tracks can be selected together to enter a value for those selected tracks (such as Work). A word about audio formats, at the time of writing only m4a files (Apple Lossless or AAC) would be recognized with these extra tag values in iTunes. Album Art is automatically retrieved from the internet, its size depends upon the source. If artwork is not of a suitable quality, missing or wrong click the artwork to choose manually. It is also possible to add album art manually by clicking [...] (button) >> Load From File, Paste From Clipboard. Note when adding new art with [...], the old art is not removed, it should be removed before adding new. Multiple artworks can be added and given a different description (such as Back Album Cover). The final maximum album art resolution is set under CD Ripper Options >> Meta & ID Tag 'Options' >> Maximum Pixel Size (defaults to 800x800 for best player compatibility). Right click on the album art to display at full resolution. Ripping status is shown for each track, informing progress and when secure ripping the secure status of a rip. Burst ripping method has no error correction, ripping is done in one shot. Ripping and encoding are done at the same time. The light grey bar on Rip Status shows the read position, whilst the darker grey bar is the encoding position. dBpoweramp Reference allows multiple CPU systems (such as dual core) to encode two or more tracks at the same time. First pass, if matches AccurateRip further ripping is not required. After passes have completed then frames with possible errors are re-ripped multiple times. The red line shows the error position within the track. The red highlight shows that frames could not be recovered whilst ripping, an insecure rip. After ripping has completed the audio is passed onto the chosen encoder. dBpoweramp Reference will use multiple CPUs if present. The rip is 100% error free, confidence of 12 indicates it matches 12 results from other people, even a confidence of 1 is enough to ensure an error free rip as long as it was not yourself who submitted the first result. Again the rip had no detectable errors, but this time the CD is not present in AccurateRip's database. Your ripping result disagrees with 12 other peoples rips, the green i indicates that frames had to be re-ripped, possibly an undetected error has slipped through. If all tracks except one have an AccurateRip verification, and the confidence (number shown in brackets) is more than one, it is likely your rip has errors. AccurateRip says your rip has errors, also CD Ripper says it is unsecure. Meta data is saved into the ID Tag of each audio track, from Composer to Record Label. Selecting the Meta tab lists all meta data, if no tracks are selected then Global meta data (ie the same data applying to all tracks, such as Album) is listed under Meta. Selecting a single track lists items pertaining to the one track. Items shown in light grey are disabled from writing to ID Tags. Encoder displays the active encoder compression settings. Audio CD Hidden Track Silence Removal, which searches within the track for long periods of silence and removes it (often the last track has 4 minutes of silence before a 'hidden track'. Right clicking on a track list column title (ie Length) allows customization of which fields are shown in the track listing. Artist, Genre and Year are only shown when compilation is checked. CRC shows the checksum calculated from the last rip, a green CRC if a re-rip matches the previous, or Red for miss-match (a sure sign that one of the rips had errors). The File Name column displays the final filename to be written, if the file exists it is shown in Blue. Track Technical highlights exotic CDs (such as HDCD or CDs with Pre-Emphasis). To set the order of columns, remove all check marks and re-check in the order required. Set allows customization of the naming convention. 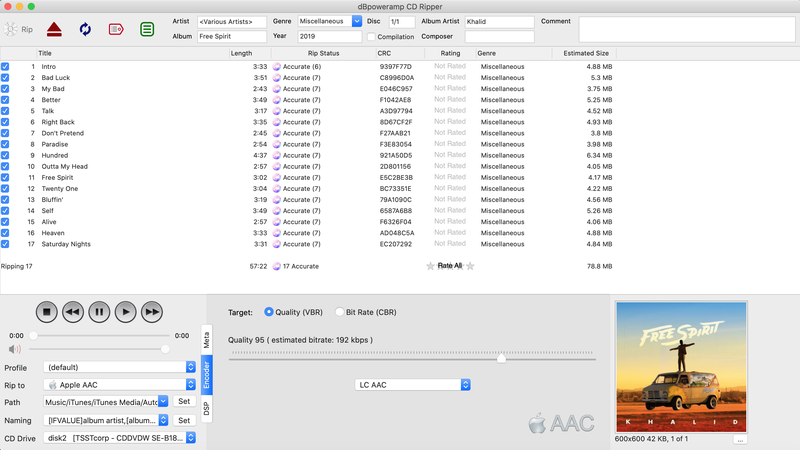 Delve deeper into CD Ripper with Advanced Options.